Anyone here play Kerbal Space Program? I picked it up a few weeks back and it's proven to be insanely addictive. The basic premise is you.... run the space program for a bunch of cute little green aliens called Kerbals from a remarkably earthlike planet called Kerbin. However! Beneath that slightly fluffy exterior, is a rather challenging game, with Newtonian Physics, stranded astronauts (ho ho, Kerbalnauts!) freezing to death and explosions. Huge explosions. Must admit, my knowledge of orbital mechanics has improved since I started playing it.... The population of Kerbin has declined though. That sounds interesting, I'll have to look it up. I discovered it just before Christmas. So far I've managed to put a couple of satellites and most recently a manned flight in orbit (and even brought the latter safely back down!) Right now I'm working on getting something into orbit around the Mun, but getting a proper Hohmann transfer set up is turning out to be rather a challenge. 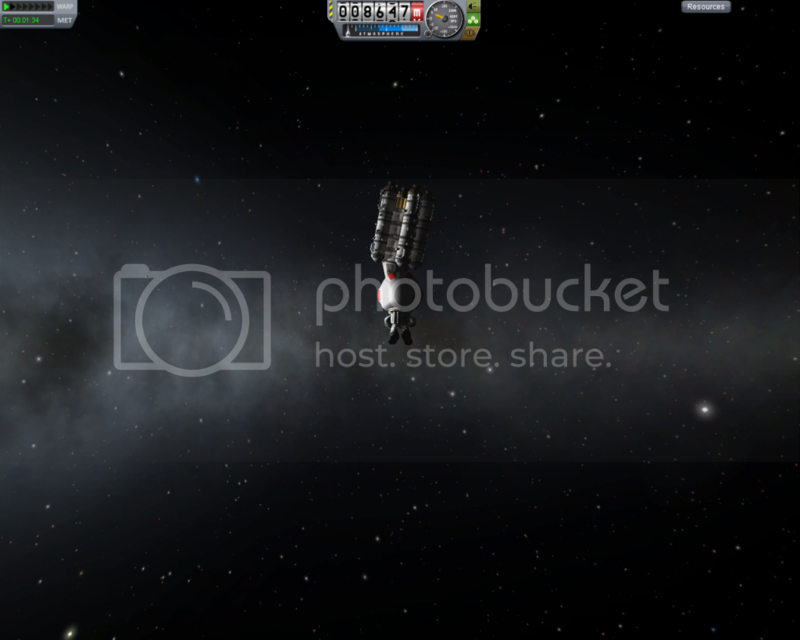 I love KSP. Bought it way back when there was nothing but a handful of stock parts and the Mun (moon) to land on. Now there is a whole solar system, functionality for space stations and satellites, and ion drives for deep space exploration. That being said, I tend to spend most of my time building unwieldy, impossible spacecraft with all the aerodynamism of an elephant. They usually crash back to the surface of Kerbin (the homeworld) or hurtle off in some far, 700+ year orbit round the Sun. But it's all endless fun. For me ... not so much all the brave cosmonauts I have killed. I completely love KSP and it is one of the few games that my kids are allowed to play at their age (with help). Currently we have a fair few Kerbals stuck in low orbit with no fuel, one who has decided to exit the solar system altogether it seems after missing the 'Mun' a bit, and a whole collection of likely doomed individuals building up their tan around the sun. 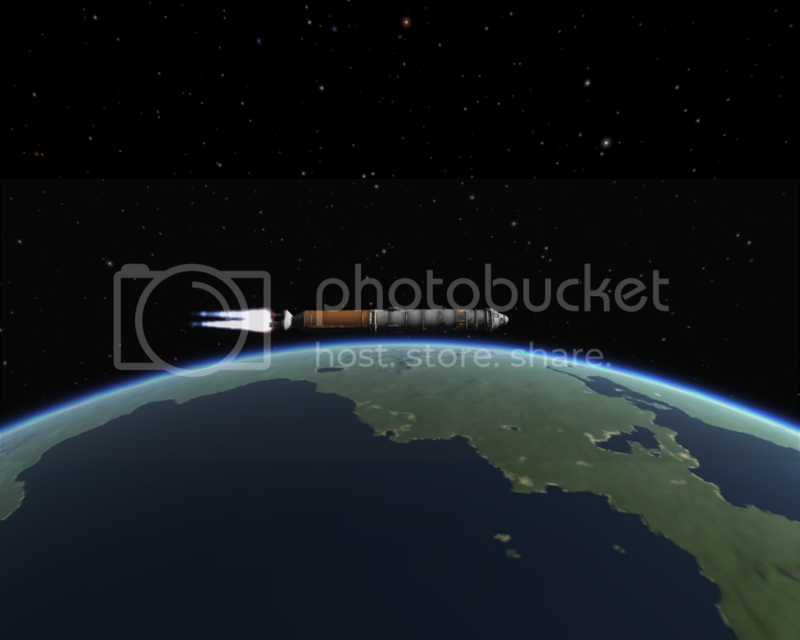 I found it ages ago and struggled to get to a stable orbit and then 'rediscovered it' around October last year. So glad I did. I landed right smack dab in the middle of this crater. The planet's equatorial radius is only 210k meters! Another, further out picture of Eeloo. It was only included recently in the 18.2 update, a 'Christmas gift' from the developers. The moon is made to resemble Enceladus, one of Saturn's satellites, its surface cracked by cryovolcanic activity, no doubt from its eccentric orbit which brings it occasionally in close contact with the gas giant Jool. The devs are intending to add a volcanically-active surface in a future update. And finally, my space command, showing all of my current missions. This was taken right after the landing on Eeloo, which as you can see took over 4 years to arrive ... and that was with a vastly overpowered rocket that cut the travel time down exponentially. Still, even with the game speed set to a maximum x10,000 for most of the journey, this was a 2 day affair for me. A truly exhilarating mission! ... That's the kind of stories that can be told with Kerbal Space Program. I''ll have to take a shot, soon, of my lander on Duna. When it landed, it came down a little too hard and one of the lander legs snapped clean off. The lander was listing hard to one side but fortunately, just lifting the two remaining legs was enough to set the thing aright. That was another nail-biter ... just one of many! I love this game. So very, very much. I am in awe of your kerbal launching skills... seriously! 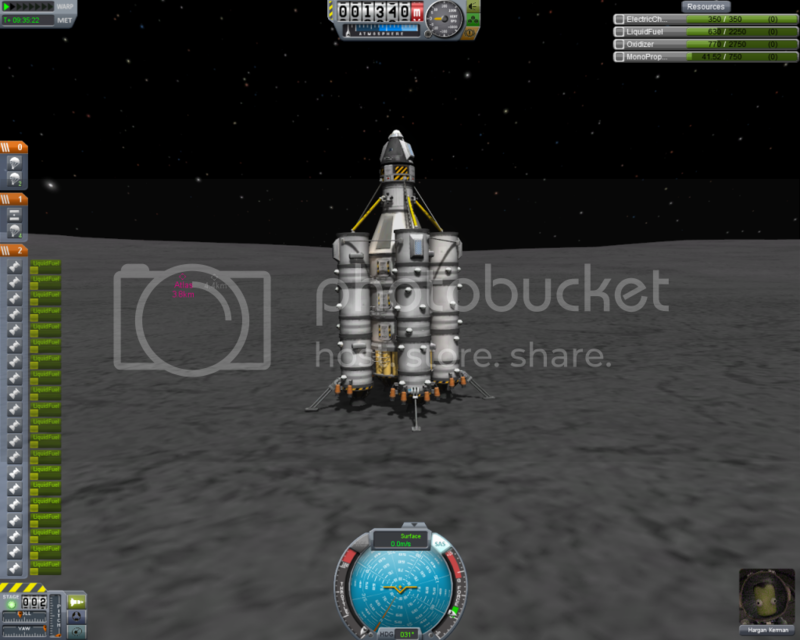 I can barely make it to Mun with fuel. Good stuff! Must go and take some youtube lessons now me thinks! I'm just a very patient cuss, I guess. I must have spent three hours last night just wrestling with that landing! Single best advice I can give, too, is that it is far better to overestimate the fuel requirements for a journey than to fall short. I always make sure I have a complete stage with full tanks just ro get from Kerbin orbit to wherever I am going. I detach it as I burn into the atmosphere of my destination. Final stage always has fuel and thrusters of its own to facilitate landing. The inteerplanetary stage winds up crashed into the surface or left in orbit if enough for a return trip. This can be a bit wasteful but better than getting stranded halfway! Yeah, I have a few tales.... It's that sort of game! Sssssssoooo, I stranded 3 Kerbals on the Mun using my cunningly designed Atlas lander due to it crashing a little bit. Specifically Bob, Bill and Jeb. Now, most players would've left them, however, due to a strangely overly developed sense of responsibility, I felt I had to rescue my brave little space adventurers. Plus.... Challenge accepted! The first objective was to build a lander that was capable of getting to Mun, had enough space to carry three extra Kerbals, then get back to Kerbin. After much twiddling I came up with the Atlas II class lander. It was little top heavy. And it didn't have enough fuel to get back. Oops! So, now I had a grand total of six Kerbals sitting on the Mun, in groups of three, 48 kilometers apart. I could probably have loaded them all into the Atlas and gotten them into orbit, but it was a long walk. I decided to build another lander, with room for 6 little Kerbals. Behold, the Beetle VI! It's so good it can get to the Mun and... Um... Run out of fuel. So, now I had seven Kerbals sitting on Mun, twiddling their thumbs! But, hark, all is not lost! Although the original Atlas lander couldn't launch, the Atlas II had enough fuel to get to low Mun orbit, as could the Beetle... Which was just under 4km from the crashed Atlas I. I decided to walk the Kerbals to the intact Beetle lander, then launch both... Then work out a way to get them back to Kerbin. With both landers in orbit, I launched another two Beetles, popped them into Mun orbit, then EVA'd the Kerbals across. This took a great deal of trial and error, and a fair bit of splattering against landers at high speed, but eventually I got them all loaded and into Kerbin orbit. Once they were back, I faced another problem. The Beetle was too heavy for its parachutes. Derp. So I built a variant of the Beetle called THE RESCUER! with most of the engines removed, moaaarrr parachutes and decouplers between all the capsules. 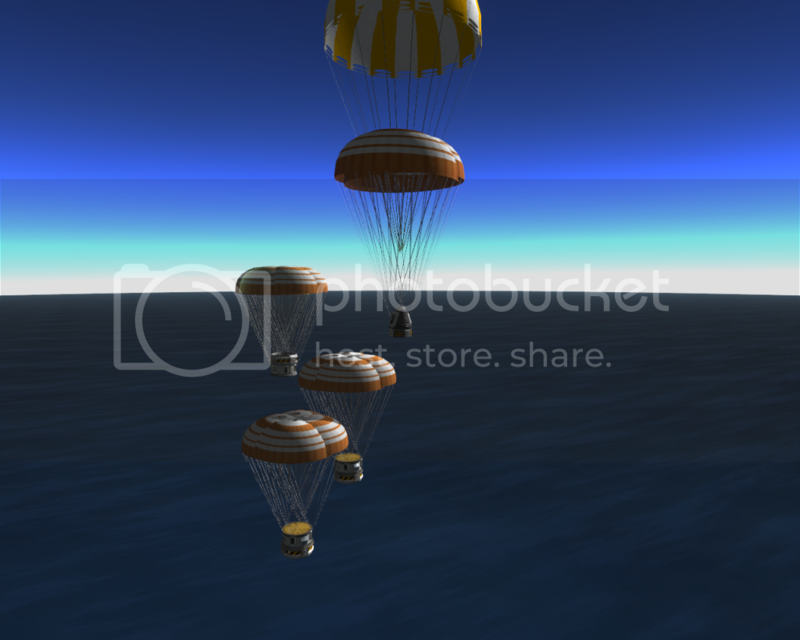 The plan was to get to about 2,000 metres above the ground, then deploy decouplers and parachutes, then they'll all float to the ground independently. It worked! And made me a better mission director. Or at least a less crap one. Ahem. Took me a week though.... And Greglan Kerman has earned his Medal of Honour! "Everyone said I was daft to send a rocket to the Mun, but I did it all the same, just to show them. It couldn't get home. So I sent another one. It couldn't get home. So I sent a third…"
Some of the best games are those that leave the players alone to do their thing, and then awesome stories like that emerge from the gameplay almost by themselves. Kerbal Space Program, FTL, and Mount & Blade have all been particularly good at this. Matthew - thanks for the advice, it still feels a bit daunting getting these fearless little man-lemmings over to another rock and back safely, one day I'll make that Mun-Kerbin return trip. Heheh, thanks. That was my Christmas entertainment. None of that Miracle on 34th Street rubbish! Returning is for loozers. My Kerbals like it just fine trapped on the moon, thank you very much. I decided to just colonize the Mun... landed a communications relay, then a one-kerb lander, then a six-kerb-lander, then a habitat module... Next up is a few rovers. LT's resident storytelling fighter pilot.